Basia Roszak left her roots in Poland and emigrated to Canada, then moved to UK. She has been residing in Glasgow, Scotland, since 1998. She attempts to bring this multicultural experience to life in her work. Basia is a full-time artist, working in both traditional media (oils, watercolors/ink) and new media (computer animation, computer graphic design). Academically, she has HND in Graphic Design, and BSC (with distinction) in Media Technology, Digital Art. Basia’s work speaks a universal language and touches the spirit of art lovers across the globe. Currently, her work appear in collections in Canada, USA, Great Britain, France, Poland, Japan, Saudi Arabia, Germany, Ireland, and Australia. Her art reflects the ordinary imagery of life, in an extraordinary way. Her dreamlike portraits give us a glimpse of people passed by on the rainy Scottish streets, people met in the underground, or remembered from crowded cafes. Basia believes that images are quite subjective unless, of course, the image evokes a strong emotion or lifts someone’s spirit; then the image conveys a special message. Her ink/watercolour employs masterful use of line and colour. Her oils draw us in with subtle blends of hues, the introspection of her subjects, and occasional whimsical or dream-inspired elements. She captures poignant emotion in her character’s facial and body expressions. 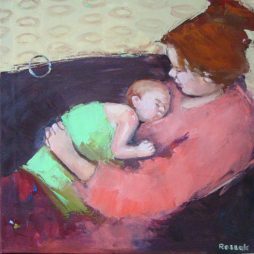 Basia’s work is visionary, fresh, and powerfully evocative.